The Bird In Hand is a delightful 14th Century Inn with a history that spans 600 years and has recently been acquired by Wiltshire brewer, Wadworth. 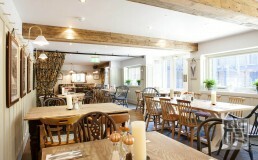 The Inn was fully refurbished with the intention that when you step through the doors you catch a glimpse of the past. 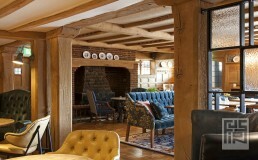 The ground floor compromises of a traditional bar with classic snug and rooms for dining, both casually and formally. The most striking element of the design is the stripped back timber beams, this contrasted with the vibrant colour schemes of the plush velvets which creates a contemporary yet classic atmosphere. The lighter tones of the painted panelling in the dining room allow for the room to truly be an all-day dining space; fresh and vibrant in the morning for breakfast and cosy and inviting in the evening. Throughout warm oak tones are complimented by traditional Morris prints and motifs in deep teal and blue tones juxtaposed by a colour pop of mellowed mustard. 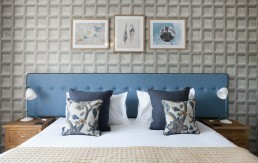 As part of the refurbishment works we completed a full overhaul of the standard guestrooms of the 20 bedroom hotel. This brings the guestrooms in-line with the high level of finish on the ground floor. Creating a calm and cosy atmosphere using a simple pared-back palette with touches of colour and pattern, the new rooms are a mix of warm oak and painted finishes in soft duck egg blues and greens. A bold wallpaper features a enlarged herringbone weave that is also found on the bed throws and cushions.